What comes after meat dresses? This. Lady Gaga's David Bowie tribute at the Grammys this week was a bit of a heady showcase of connected self and wearable tech. Whatever you think about the performance, you've got to respect the tech involved which included tracking her face to match up 'digital skin' projections and an LED wall controlled by Intel Curie-powered smart rings which Gaga wore during the performance. 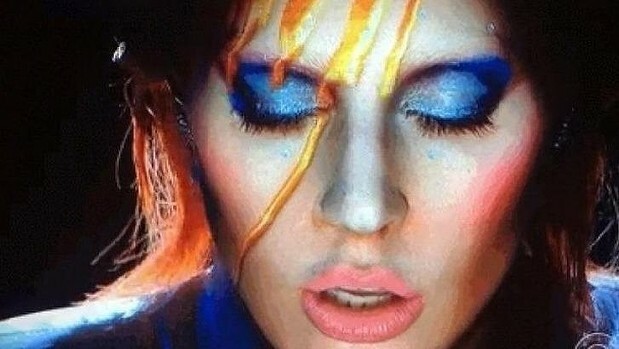 The singer covered eight Bowie classics during her tribute at the Awards, with some of his iconic looks - such as Ziggy Stardust - applied via "digital make-up" projections that were precisely mapped to her face, thanks to tracking from Intel's RealSense cameras. A 3D model was made of the contours of her face and the projectionists were able to follow her moves in real time. Lady Gaga also wore an oversized bauble of a smart ring, with an Intel Curie module inside. Well two actually, which she used to control an LED wall as she sang and danced, moving her wrists and arms and also to interact with a hologram. Elsewhere, it was all go with a robotic rose gold piano and a bunch of other visuals. Intel is having a busy week after it debuted its new collaboration with Chromat at New York Fashion Week where another show from Neurocouture projected GIFs of Donald Trump's face onto oversized ponchos. It's just a shame the Intel angle was pushed so hard at the actual Grammys ceremony since it was, you know, a tribute to a much loved musician.